Today, December 25, 2008, two artists died: Harold Pinter and Eartha Kitt. The following are excerpts from NPR articles about each of them, with links to read the articles in their entirety. British playwright Harold Pinter, who won the 2005 Nobel Prize for Literature, died Christmas day at the age of 78 after a long battle with esophageal cancer. 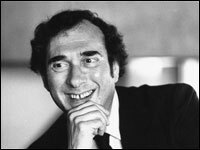 Pinter was best known for writing such plays as The Birthday Party, The Homecoming and Old Times. He also adapted other writers' novels for the screen, including The French Lieutenant's Woman, A Handmaid's Tale and The Comfort of Strangers. Pinter wrote dozens of plays, essays and poems. His lifelong friend, actor and director Henry Woolf, says Pinter's major contribution was what became known as the "theater of menace." Singer and actress Eartha Kitt has died of colon cancer. She was 81. Kitt, who was ostracized as a child in South Carolina because of her mixed-race heritage, got her start in show business as a dancer and vocalist, and earned early international notice as a featured singer in a Paris nightclub.